For the past two years, I’ve been in a rut. I haven’t had the motivation to exercise, or eat well, or push myself harder to achieve my goals. Eventually, that sad routine put me in a place where I was very unhappy with myself, so recently I decided I needed to get out of the funk. It wasn’t easy to make conscious decisions to cut back on drinking, wake up earlier, hit the gym several times a week (and actually work out), and eat healthier — but I did it. Changing my routine was the answer to having better days and being happier overall. A simple change like altering my diet to include healthier foods and eliminating the pizza and burgers has made a big difference. I wake up earlier without feeling run down. In fact, I felt so energetic this morning that I went for a mile and a half run at 7 a.m., which is totally out of character. I’m noticing that I have more stamina to make it through the workday too, whereas before I would experience fatigue in the late afternoons, especially if my lunch was heavy. Because of the level of increased energy I have, I’m more motivated during the day and really getting things done. I’m completing projects ahead of time instead of waiting until the last minute, which leads to more time that I can spend cultivating new clients for my small business. Another benefit to increased productivity is that I can relax easier at night because I don’t have a million things on my mind that I should have done but didn’t. When I’m in a slump, my head is not where it needs to be — and that’s detrimental to my creative profession. But the increased productivity and energy have a direct correlation to increased creativity. My mind is more open now because I’m not thinking about being sad and concentrating on the shoulda-coulda-wouldas of my life. Rather, I’m changing my routine so that the positive aspects of my life — along with my creativity — can flourish. I’m a longtime sufferer of depression, for which I take medication. The meds help, of course, but I also took some time recently to think about the reasons why I feel depressed. Is it because of situations that happen to me or because of situations I created? After a bit of soul searching, I realized that I’m unhappy about several things over which I have ultimate control — like my weight, for instance. I’ve always been a thin guy, but I’ve put on some pounds over the past few years. I stopped going to events to which I was invited, and many times I refuse to take photos because I feel fat. That’s not the person I want to be. I want to be that happy, outgoing guy that I once was. After identifying one of the reasons that contributed to my feelings of worthlessness, I put the plan in motion to change. As a result I’m increasingly happier because I’m taking steps toward self-improvement I can be proud of. When I was in the same old routine of working from home and living like a shut-in, I missed out on a lot of activities and events. As I just mentioned, I didn’t want to go out because I didn’t feel good about myself. But now that I’m starting to feel better about myself because I changed my routine, I’m participating in more activities and meeting new people, all of which are pleasurable. If I didn’t want to be around myself before I changed my routine, I’m sure nobody else did either. Who wants to hang out with someone who’s depressed and whining about things that they can totally change? Definitely not me. So it stands to reason that when I’m in a pleasant mood, the people around me will enjoy my company much more. Changing your routine doesn’t have to include the changes that I’m making. Mine are rather serious lifestyle decisions, but if all you need is a small change, by all means, do it your way. There are lots of changes you can make — taking another route to work, altering your reading habits, switching the time of day you go to the gym, establishing date nights to enhance your relationship — the list is endless, really. 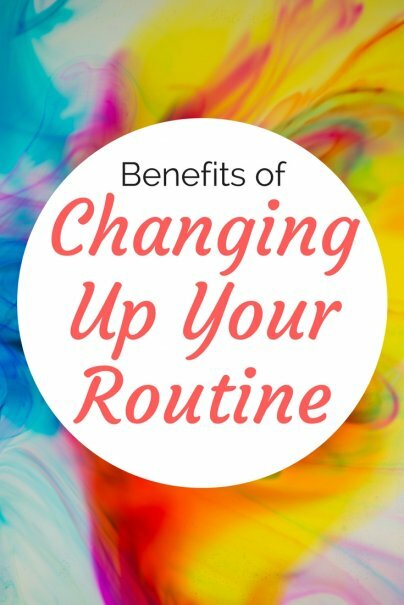 The most important part of changing your routine is that it somehow makes your life better so you can reap at least a few of the benefits I’ve listed. Your turn. I’d love to hear about recent changes you’ve made to your routine and the benefits you’ve experienced. Let me know in the comments below. Its so true that when you are more active and eat healthier foods that you have increased energy. If you chose to get moving more throughout the day, and get enough sleep at night, your increased energy will translate into feeling better overall. I feel like the problem with people my age (twenties) is that they are just too lazy to get moving! When I don't exercise for a few days, I find it so much harder to get out of bed in the morning. This is a great post that many will benefit from, thanks for sharing. Wow, a two year rut? Sorry to hear that--that's a long time! 1. I spontaneously booked a trip to an Arizona dude ranch to learn how to horseback ride. At the time, I shook my head and thought, "God, I've really gone insane now! I don't know the first thing about horses." ...I found out it was not only an activity that I loved, but I'm also naturally good at! Living like this can be exciting. It doesn't always cost money and you'll get out of bed and think to yourself, "Wow, I wonder what sort of craziness I'll get up to today?" Sometimes changes, big or small, are all you need. It's a matter of choice and reponsibility. We can truly be whatever we want to be, it's just a matter of saying that you want to be that and take the responsibility to go after it. I enjoyed your post, because it takes courage to stand out there and say that you are not operating at your best level and that you are responsible for that. Thank you for this post. It's amazing how much better we feel emotionally, physically, and mentally when we live an active lifestyle. Thanks for sharing this excellent article. I look forward to reading more of your works. Yes! What a timely read. My husband and I just made the decision this week for me to stop my career of 15 years as a piano teacher. I had 14 wonderful years running a large studio -- it was financially necessary and I had wonderful families that I worked with. But recently we moved to a new city and along with my chronic health issues and some depression from not having friends for the first year, teaching got much more difficult. The handful of families here were less easy to work with, partly due to the culture, and driving was more stressful. It was who I was, and what I had done for so long, but the stresses had started to outweigh the benefits. It took an unusually difficult week for me to realize that maybe I could change things a bit.